Posted on May 30, 2013 . If you're developing a web application with Parse, it's extremely important to make sure you have "Log XMLHttpRequests" active in your dev console. You can see the requests in the Network tab without having to do anything, but I'm usually in the Console tab when developing, and I'll catch any problems more quickly if these requests are showing up alongside my other logs. 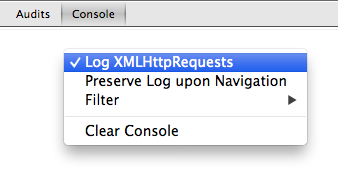 To activate, right click anywhere inside the Console and select "LogXMLHttpRequests" to toggle the logging. Now, whenever Parse hits their servers, you'll know.